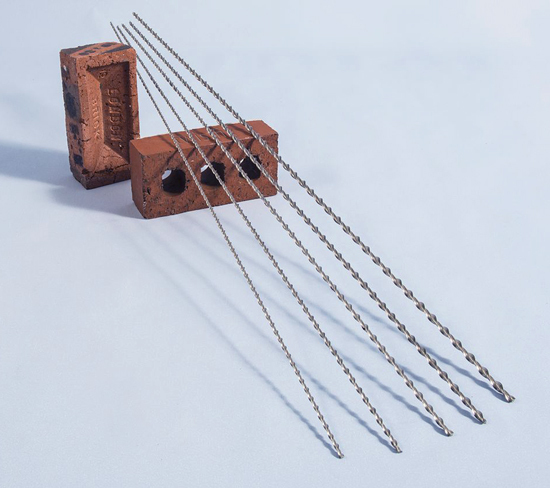 Helically twisted masonry rein­for­cement rods have for 30 years been used in the structural repair sector of the UK building industry; but do you know whether Helifix Helibars or Twistfix bars have been used? The original Helibars were invented and patented by Twistfix Director William Ollis, who recently re-engineered his invention. These upgraded Twistfix bars are produced with a greater degree of product consistency to improve upon the performance of the early Helifix product. Twistfix only supplies helical bars produced with this advanced engineering.­ The upgraded bars are produced in the UK's only manufacturing facility that, under one roof,­ takes in round wire and sends out finished helical products. Other manufacturers merely part-process pre-shaped wire that has been cold roll-profiled by a third party. The reinforcement is commonly used for stitching cracked masonry and lintel reinforcement as well as foundation repairs. The combination of Twistfix bars and a high performance grout forms the basis for a versatile, reliable and highly successful masonry repair system. Twistfix helical bars are bonded into slots that have been cut at pre-determined levels within the masonry. In the longer lengths they are used mostly in lots of four, two rows each with a pair of bars, to form the upper and lower flanges of a deep masonry beam which will carry quite a large area of masonry above an unsupported area. It does this by redis­tri­buting the load placed on the structure to solve any problems which may have been caused due to localised structural movements. Sometimes the helical reinforcement products are used in existing masonry in order to reinstate failed lintels. In the shorter lengths they are used individually in order to perform reliable and permanent crack stitching. How do you install helical rods? Helical bars are buried into slots made in the wall surface. The slots are typically orientated horizontally along the face of the wall and the bars are bonded to the masonry using a high performance polymer modified grout. What are the applications for helical bars? There are a wide range of applications where helical rebars may be required or needed for masonry repair. They are used widely for crack stitching, lintel repair and creation, horizontal structural restraint as well as forming deep masonry beams, supporting brickwork above new openings in existing masonry and reinforcing any new build masonry. Both brands are proven to provide effective and durable repairs. What are the benefits using these twisted bars? Helical bars have great axial strength when grouted into walls. They are able to spread loads and accommodate natural and cyclical movements within a building whilst holding the components firmly together. The reinforcing bars are generally concealed within mortar beds to disguise installation. General builders are able to buy Twistfix helical bars in a wide range of lengths and diameters; all with improved product tolerance and consistency. Remember, not all helical bars are the same and an original product is not always the best, especially when it has been superceeded and improved by the inventing engineer. If you are unsure as to whether to use Helifix Helibars or Twistfix bars, and which is likely to be the most suitable for your requirements, then please contact a member of our expert team who will be able to offer you the best advice and guidance. For more information then please contact us on 0845 123 6007 or email sales@twistfix.co.uk.